These rules are in place to protect the rider, horse, and the integrity of the cross country course. Any violation of HPW rules/policies may result in the revocation of membership and/or removal from the property. PLEASE DRIVE SLOWLY! 10 MPH ON ALL HORSE PARK ROADS! Show participants may bring dogs only during events and must obey all HPW dog related rules. Dogs are prohibited from cross country course at any time, while cross county course is open for equine use, except during designated times. No unattended or loose horses - no unattended turnouts in the Round Pen! No unattended or loose dogs in barn areas or arenas. All members and visitors, please clean up after yourself and your horses! Dogs MUST be leashed, kenneled, housed or tied in barn areas at all times/Dogs are not allowed in any arena! For full details refer to "Dog Rules" below. No Dogs permitted to accompany a rider or riders while riding. Rider's family, guests, and spectators must stay off course and keep to designated viewing areas. Rider's family, guests, and spectators must respect the "NO DOG" policy on the cross country course. Show exhibitor's (non members) are not permitted to use jumps on the cross-country course. All riders/trainers must either attain a HPW "day use" or "full" membership with required paperwork and/or insurance certificate PRIOR to using the facility. Riders, when schooling on course, MUST where a safety helmet, protective vest, approved medical armband, and be accompanied by a partner over 18 years of age with a cell phone. Riders must never jump a "closed" fence or any "closed" section of the course. When cross-country course is closed it pertains to all the portions of the course, for all types of riding and driving. No unauthorized vehicles permitted on the course. Why Are There Rules For Dog Members? Member safety is the #1 priority at the Horse Park. The shared environment of dogs and horses provides a challenging mix of uses. Many horses are frightened of loose or loud dogs, dogs running through water or at high speeds, or dogs chasing after tennis balls, Frisbees or other thrown objects. Loose horses are a hazard and are extremely dangerous to pedestrians, vehicles and other riders. Strict adherence to Horse Park rules is necessary to keep the Horse Park safe and available to all members. Who May Bring Dogs to the Horse Park? Where Are They Allowed? Dog Walker Members and Full Members may exercise their dogs on the cross-country course or bring leashed dogs to the remainder of the Horse Park. If it is otherwise unoccupied, dogs may also be exercised off leash in the south parking lot / trailer parking area. Show participants may bring dogs only during events and must obey all Horse Park rules. Subject to following such rules, show participants may exercise their dogs on the cross-country field or perimeter trail during designated dog hours only. Day Use Members are equestrian members ONLY. They may not utilize the Horse Park for their dogs. The cross-country course is designated into "interior" and "perimeter" areas. See below for seperate uses. The perimeter trail is the trail along the external fence line of the Horse Park. The tracks of the cross-country course are the interior areas. Permitted members may exercise their dogs on the cross-country course during designated hours if the course is open to equestrian use and at any time the Horse Park is open if the course is closed to equestrian use. Designated hours for interior cross-country access are currently sunrise to 10AM and 5PM to sunset. The perimeter trail is open to permitted members and their dogs at any time the Horse Park is generally open, and whether or not cross-country is open to equestrian use, but subject to right of way and general rules. If a competition is being run which utilizes the cross-country course, no dogs are allowed on the interior cross-country course or the exterior perimeter trail at any time during the active phase of the competition. Dogs may be off leash in the cross-country field ONLY if they are under complete voice control at all times (and should never be more than 100 feet from the handler). It is the handler's ultimate responsibility to be on the lookout for approaching horses, in all directions. All dog walkers must abide by general park hours and rules. Dogs MUST be leashed, kenneled, housed or tied in barn areas at all times. Dogs may not ever enter an arena, and are not permitted next to an arena that is being used. Horses/riders always have right of way. It is mandatory that event when it is otherwise permitted for a dog to be unleashed (i.e. on cross-country course), any dog who is being approached in any direction by a horse, must be put on a leash and must yield to the horse/rider, even IF the rider grants permission to stay unleashed. No dogs may accompany you while riding or "run alongside" vehicles, including golf carts, motorcycles, bicycles, etc. Please clean up after yourselves and your dogs whenever you are at the Horse Park at any time. Courtesy refuse bags are available at the entrances to the cross-country course and near the Four Winds Annex and courtesy leashes are available at the main office if you have forgotten your own. No "Professional Dog Walkers" are permitted at the Horse Park at any time. The Horse Park practices a "no tolerance" policy as it relates to aggressive, disobedient, mismanaged and/or mishandled dogs. Any such dogs will not be allowed to return to the Horse Park and members may lose their membership privileges. Please report any infractions of these rules by fellow members, boarders or staff to the Horse Park office immediately. Any violation of HPW rules/policies may result in the revocation of membership and/or removal from the property! In the case of an emergency, please immediately notify the Horse Park Office or a Horse Park employee. If the Office is closed or no one is available, please use a Cellular Telephone to summon help by dialing 911. 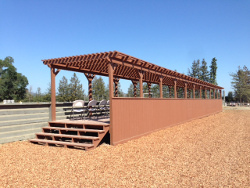 The Horse Park is located at 3674 Sand Hill Road in Woodside, San Mateo County, California. Updates on activities and facility conditions are available on the website or by calling the Horse Park office at (650) 851-2140 during regular business hours (9am-4pm MON-SUN). Gates will automatically open/close as each vehicle enters and exits during regular business hours. Between 8:00pm - 6:00am access to the park will be for Emergency Only and will require an access code. Only full-service boarders and resident trainers will have receive the access code. The code cannot be transferred to anyone other than the assignee!